One of the biggest things you'll miss when you leave for university is home cooking. Weirdly enough, as most students admitted, they didn't even think about this. When they left for the first time, they imagined they would miss their hometown, their family, and friends, maybe their dog, but never once did they think about the food. It's such a natural given that you don't stop to think about it for a second. However, sooner than later, most students find out it's not easy to cook for themselves. Plus, eating at the cafeteria or going out to eat can be unhealthy, time-consuming, and expensive. We've all heard and read stories around the internet of students who eat mostly ramen all the time. Although unfortunate, it's true. Ramen, just like curry, for example, is just a very simple and money-saving alternative to everything else food related. But that doesn't make it alright. University is actually one of the most taxing periods you'll ever experience in your life, filled with sleepless nights and never-ending days. This is why eating right is essential. Therefore, we are here to destroy the myth that students can't eat well on a budget and with very little time spent in the kitchen, by providing you with this healthy student's guide to university recipes. All this translates into the fact that your schedule while in college will be packed tightly with all sorts of activities. There will be no time to sleep, relax or rest at all. But this also means you need to take extra care of yourself. And alimentation is the first thing to look at. Indeed, college will go out of its way to throw as many obstacles in your path as possible, food wise, but you need to try and surpass them. According to some extensive surveys in college weight gain, first-year undergrads gain some eight pounds during the first year, most of them in the first semester even. That's because you no longer have your parents with you, making sure you eat well. This can lead to obesity and heart problems in the long run and fatigue, nausea, headaches, and lack of concentration on the short run. Therefore, in order to avoid these perils, make sure you eat well right from the start. As a first-year student, chances are you've never touched a skillet in your life. You've never boiled an egg, and you can't even begin to imagine how a treacle tart is made. But that's alright because you don't really have to know. In fact, this is one of the reasons why students tend to shy away from cooking when they go to university. Most students associate cooking with complicated recipes, such as Beef Wellington or Shepard's Pie, which scare them away from the kitchen. It's understandable, seeing as this is what they usually ate at home. But it shouldn't necessarily be like that. This is why we've found some excellent university recipes and divided them by year of study. These ones are under the ‘first-year undergrad' category because they require almost no cooking or experience at all. They can either be simply whipped up by mixing some ingredients or by using a microwave to make it as simple and quick as possible for the first-year student. Egg and sausage sandwich – it takes around 6 minutes to make this. You need to scramble 2 eggs and place them in the microwave for a few minutes to cook. 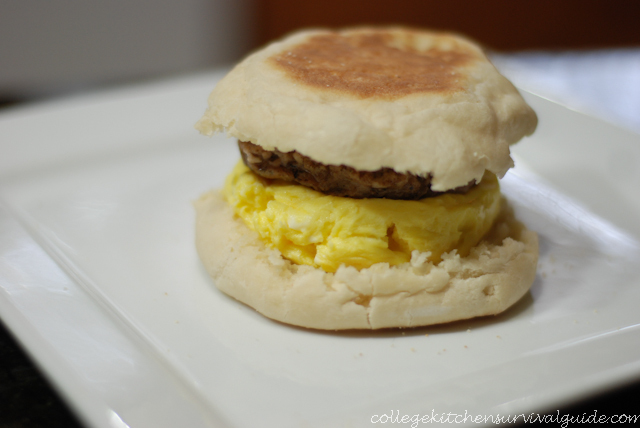 Take them out, cut an English muffin in half, place the egg and the sausage inside and you're good to go. You can actually eat this one in class, to save some time. Cream cheese and jelly on delicious warm bread – just 2 minutes is all you need for this healthy meal. The recipe is just as you imagine. Spread jelly and cream cheese on the warm bread and enjoy with a nice cup of strong, sweet tea. Egg toast with grated cheese – this one is extremely delicious and easy to make. The only thing is that you need a toaster. Cut a thick slice of bread, hollow the middle, crack an egg in the hollowed space, sprinkle grated cheddar around it and place it in the toaster. Here is what you'll have when it comes out. Traditional English tea sandwiches – these might remind you a bit of what your great aunt used to serve when you went to visit her as a child, but they will make for a perfect, easy, and healthy meal alternative while in university. You can try the cucumber sandwich, made with white bread, butter, and cucumbers, the smoked salmon one, with added crème fraiche, or the watercress sandwich, with either boiled egg or goat cheese to complement the watercress. The grilled cheese – this sandwich is every student's best friend. However, you need to know that it finds itself in a somewhat grey area as far as health is concerned. As long as you use lighter cheese, it's alright, but don't overdo it, because the fat content in it will harm you on the long run. Tuna salad – another great and very healthy option is the tuna salad. Make sure to stock up on cans of tuna, because you will love this one. Deli meats and cheese roll-ups – this recipe is actually even a bit fancy, so you can use it when you have guests over. 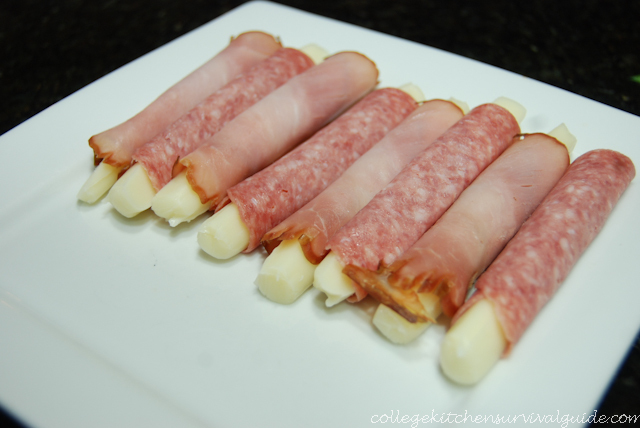 Cut your cheese in strips and roll them in your favourite, assorted deli meats. Easy and impressive. Sausage and rice – you can always buy some packs of instant rice if you don't feel like boiling it yourself, although that's easy too. After you prepare the instant rice, slice the sausage and mix them up. Be careful to use a light chicken or turkey sausage, because this meat specialty is not the healthiest. American ball-park hot-dogs – you can whip up these little treats exactly like you see them in Hollywood movies. Slice open the hot dog, but not all the way through. Fill it with cheese and microwave it for 30 seconds. Put it in a bun, add ketchup, mustard, relish, and onions, and enjoy. Chicken Teriyaki with rice – does this sound daunting? It shouldn't. You can always prepare the chicken breast yourself by simply placing it in the oven, or you can buy it from a rotisserie. Prepare some instant rice and soak everything in teriyaki sauce. Cheese and salsa quesadilla – spread out the tortilla, sprinkle your favourite cheese on it, spoon salsa all over it, and microwave for 30 seconds. Add more salsa on top, as well as cilantro. 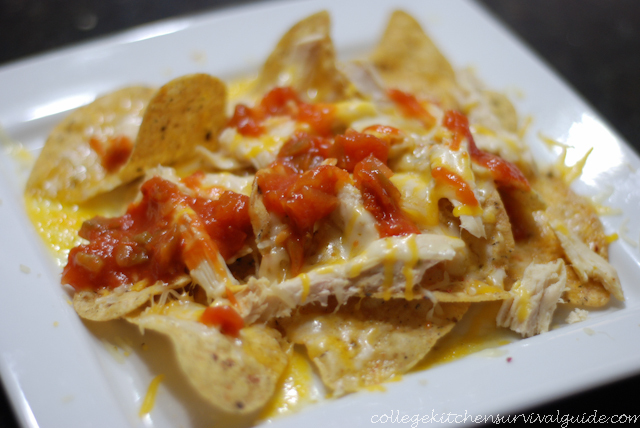 Spicy Chicken and Cheese Nachos – these are both things you can buy. Shred the chicken breast, arrange it over the tortilla chips, sprinkle grated cheese on top, microwave for 30 seconds, drizzle hot salsa over everything, and dig in. Scottish Sausage Rolls – the easy, first-year student way, of course. This means that, instead of the ground beef normally used, you can simply make them with sausages. Therefore, roll some halved sausages in puff pastry, brush the pastry with beaten egg and cook them in the oven for about 25 minutes. They are a bit like pigs in a blanket, but with a more Scottish aftertaste. Fish and chips – no list could have been complete without fish and chips. You can buy the fish, should you not want to fry it yourself, but you can make the chips. It's the easiest thing in the world. Bread and butter pudding – it's one of the simplest dessert recipes out there, it's healthy, and it will satisfy your cravings for something sweet. The recipes vary, but the basic idea is for you to crumble some bread or croissants in a pan, add eggs, cream, sugar, and nutmeg, and let it all sit in the oven until golden brown. In your second year of study, you've probably gained a bit more experience in cooking. These recipes, apart from an increased level of difficulty, introduce limited use of a stove and produce rather large quantities of food. Crispy bacon – the easiest and healthiest way of cooking bacon is by placing it on your oven's rack and leaving it there for a few minutes, until it's properly cooked. Remember to place some tin foil underneath, so that you don't mess up your dorm's stove. Runny eggs over-easy – The secret here is to have a lot of patience. You need to wait until the pan is hot, then wait some more until the egg whites are no longer translucent, on both sides. There is a science behind making a runny fried egg, but it's completely worth it. Sunnyside up eggs on toast – if you don't happen to be a fan of the runny over-easy eggs, then try the Sunnyside up ones. Simply crack the egg in the hot pan, wait until its white is cooked, and then place the egg on some freshly buttered toast. Hardy oatmeal and peanut butter – this recipe will keep you full way past lunch time. You need to mix two tablespoons of peanut butter with some rolled oats, add bananas or any other fruit you like, and a cup of tea. All the protein and good fats in it will give you more energy than you thought you could have on a cold, rainy, university morning. 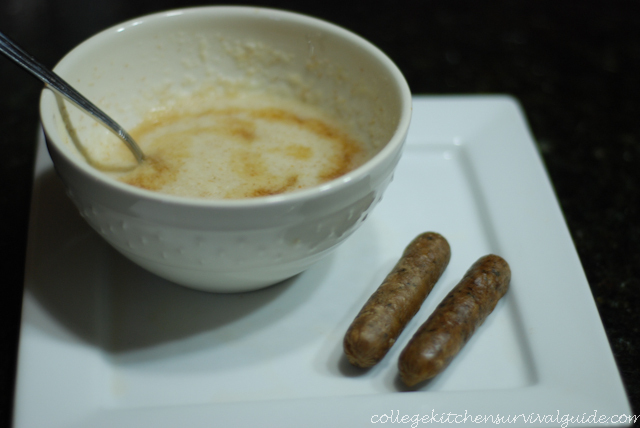 Cream of wheat with breakfast sausage – you can buy packed cream of wheat, prepare it, and then add some swirls of maple syrup for extra flavour. Pair it with two slightly burnt breakfast sausages and you have yourself a great on-the-go meal. English muffin pizza – This is as easy as they get. Half you English muffin, add tomato sauce, grated cheese, and some pepperoni on top. Place it in the microwave for only a few minutes, until the cheese starts to melt. Hardy egg salad – you need to first chop up the egg whites of several hard boiled eggs. Then you have to combine the yolks with some mustard and mayo. Then add the egg yolk mixture to the whites and pair everything with lettuce and vegetables. Café tuna melt – this is another classic sandwich, which you mostly find in cafes. Mix some canned tuna with mayonnaise, spoon it over toast and add a thick slice of your favourite cheese, preferably one that melts. Go back to the toaster and let it sit there until the cheese has melted thoroughly. 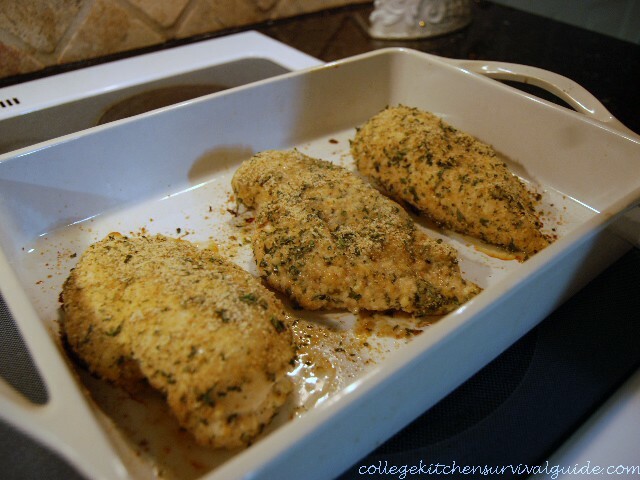 Breaded baked chicken – this is one recipe that can get as messy as you want. Rub some mayo on the chicken breasts until they are fully covered. Then coat the meat in breadcrumbs and cook it for 30 minutes. An important thing here is to cook it covered, so that it doesn't burn or dry out. You can then uncover the chicken and cook it for an additional 15 minutes, until golden brown. Wrap with Caesar salad – as simple, yet as delicious as they come. Spread out a tortilla, add some green lettuce, shredded chicken breast, and plenty of Caesar salad dressing. Wrap everything up nice and tightly, so that the sauce doesn't drip. Portobello mushrooms stuffed with spinach – it's exactly as easy as it sounds. Add chopped spinach to each and every cap of mushroom, season with salt and some cayenne pepper. You can also add, if you wish, some cheese on top of that. Then comes a layer of breadcrumbs. Roast them for 18 minutes, covered with a tin foil for the first 15. Baked potato stuffed with cheese and broccoli - choose a handful of very big potatoes. Boil them without peeling them. Once cooled, scoop them so as to create a hollow in the middle, but not all the way. Mix the resulting potato scraps with broccoli and cheese, spoon the mixture into the potatoes, and cook for 15 minutes. Chicken wings in baked parmesan crust – this sounds a bit complicated, but it really isn't. 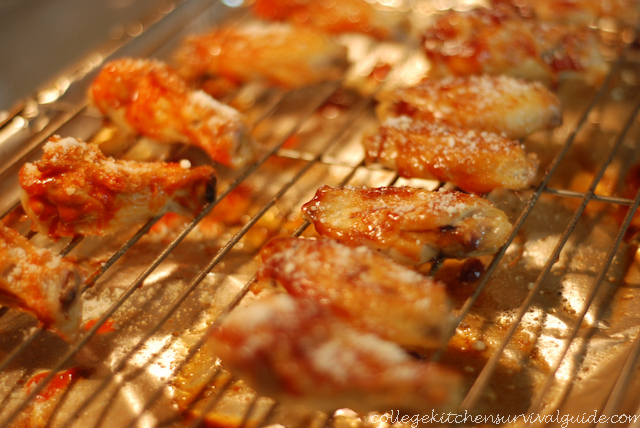 Place the wings on the oven's rack and bake them for about 25 minutes. Bathe them in some BBQ sauce and sprinkle parmesan cheese on top. Then continue baking for 5 more minutes, until they are crispy. Bubble and squeak – as soon as you hit your second year in university, you can get started on making that bubble and squeak we all love so much. The glorious recipe calls for mashed potatoes, bacon, eggs, oil, butter, cabbage, and onions to be all mashed up together and fried until they start bubbling and squeaking. Cambridge burnt crème – an easy and fast recipe that will save you a lot of trouble. This is the English version of crème brulée, and legend has it the dessert originated at Trinity College, in Cambridge. This particular set of recipe ideas will require full use of a stove. However, since you are in your third year and you now have access to the kitchen and its appliances, you are able to try more intricate and equally delicious meals. Buttermilk pancakes - the easiest way to make pancakes in your dorm room is by using a store bought pancake mix. Add buttermilk and eggs to it and fry the pancakes. You can always dollop some nice whipped cream on top, syrup, and fresh fruit, for a complete and balanced meal. French toast – you simply need to mix some eggs with milk and a dash of vanilla, coat some thick slices of bread in it and fry them in butter until golden brown. There's, probably, no other breakfast more delicious than this one. Egg and sausage sandwich – the beauty of this recipe is that it produces a hardy sandwich which you can eat on the go. Slice an English muffin in half and toast it with some cheese on one side. Add the sausage patty and a well cooked egg. Wrap everything up and you're good to go. 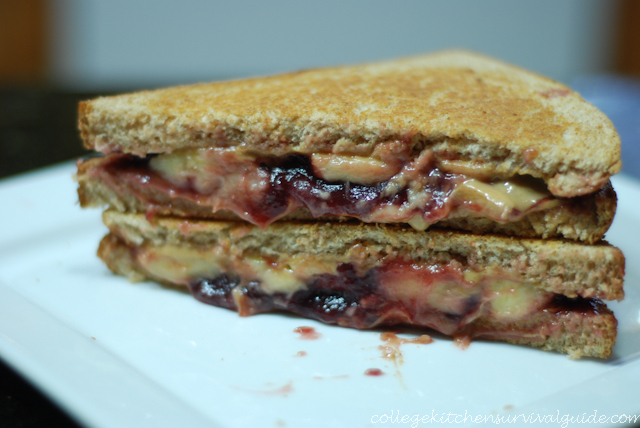 Toasted peanut butter and jelly sandwich with a twist – the twist being the banana. Butter your toast with regular butter, spread peanut butter on both sides and slice a whole banana on top. Then spread the jelly heavily on the other side and bring the two sides together in one, marvellous sandwich. Avocado and hummus sandwich – this is one, very fancy sandwich that is incredibly healthy. Simply spread some hummus on one piece of toast and place a few medium slices of avocado on another piece. Add some lemon juice to flavour the hummus and keep the avocado from browning and enjoy. Bell peppers stuffed with sausages – you need to break up some sausages, mix them with some rice and tomato sauce, and fry everything up in a pan. Stuff the peppers using this mixture and then add some parmesan cheese on top. Cook for one hour or until the bell pepper is soft. Breaded chicken cutlets – dip some flattened chicken breast into a beaten egg. Then dip it in the bread crumbs and make sure the meat is evenly covered. Fry it for 4 minutes on each side and bake it in the oven for 10 minutes. You can serve it with rice or mashed potatoes. Broccoli and cheese casserole – there are quite a few ways of making this dish, depending on the ingredients you use, on the type of cheese, or if you wish to add mushrooms or not. Therefore, do some research beforehand and pick the recipe that suits your taste buds best. Homemade meatloaf – you cannot cheat on this recipe if you're in your third year of university. You have to do it yourself, because it will be very rewarding. As a tip – you'll soon discover it's not at all difficult to make it, and you'll find yourself repeating this recipe all the time. Sweet and spicy sausage and peppers – This one, if you follow the recipe correctly, is simply a very fancy and delicious hot dog. You need to bake the sausages, bell peppers, and onions with tomato sauce in the oven, until the sausages are brown and the vegetables are a melted sauce. Place them in a bun and you have a winner hot-dog. Tuna and noodle casserole – combining sweet tuna, peas, corn, and cream of mushroom, pouring it all over noodles and covering everything up with crushed chips is one tasty dish. Bake everything until golden. The smell will make it even more irresistible. Roasted asparagus with parmesan – sometimes you need to class it up, especially when you have guests. This simple recipe does exactly that. You need to first let the asparagus sit in some cold, salted water, so that all the sand can be removed. Then season it and roast it in the oven. Don't forget to add parmesan all over. Eton mess – this is, probably, the most iconic university desserts of all time. The story of this amazing desert is that there were some picnickers at Eton, of course, which had packed a lunch in a basket. It also included a big merengue, which they were planning to eat for dessert. Their dog, however, a Labrador, sat on it and crushed it, making it combine with some fruit and cream, which also got crushed. The picnickers ate it anyway, and the dessert got named Eton mess. Whether you are in your fourth and final year, or your first post-grad year, you don't have so much time to cook anymore, that's why we'll only include a few recipes here. However, you now have enough training and experience to whip up just about anything, so these fancy recipes should be right up your alley. Eggs Benedict – This is quite a complicated recipe, but as stated above, you can now pull it off. First of all, you need to poach the eggs, which will not be an easy task to accomplish. Secondly, you will have to make a hollandaise sauce from scratch, something very tricky to do. Once you've mastered these two, put some broccoli over the egg, a piece of ham on top, and then lavish everything with the buttery sauce. Breakfast cups with ham and cheese – You will require a muffin tin for this. Place a slice of bacon in each cup, add spinach, beaten eggs, and grated cheese. Fill the tin to the brim and place it in the oven to brown. Cheeseburger – yes, you can make these in your dorm's kitchen as well as a healthy alternative to buying them. You can add chopped bacon, any kind of cheese you want, even combine multiple sorts, cook the patty as much as you want, and even add an egg to it. Cathedra mea, regulae meae, my cheeseburger, my rules. 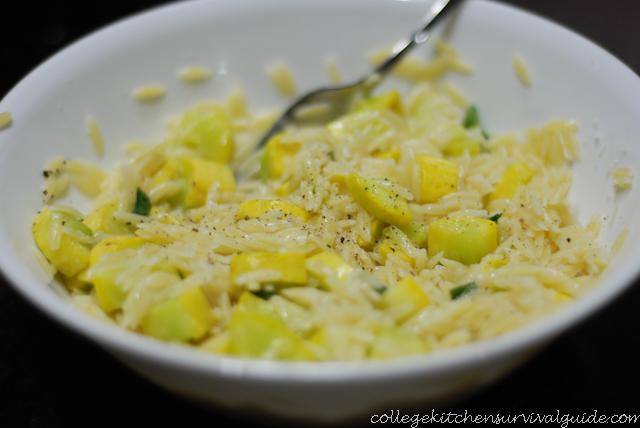 Sautéed squash with orzo – orzo is a type of pasta that was shaped to look like rice. This means you can buy it in a box from the market and prepare it exactly according to the instructions. Put some diced squash and some garlic in a pan and sauté them. Mix them up with the orzo and enjoy while hot. Lemon garlic chicken – this recipe is as delicious as it sounds. You basically need to fry your chicken drumsticks in a pan, remove them and then make the sauce. Add some white wine, garlic, and lemon to the same pan and cook until reduced. Then pour the creamy sauce on top of the chicken drumsticks. Pasta Primavera – For this, you need to combine some alfredo sauce, which you can make yourself or buy at the supermarket, with wine, chicken or vegetable broth, and garlic. Do not use wine if you are under 18. Saute some assorted vegetables until they are crisp tender. Mix the vegetables with the pasta and pour all that sauce on top. Serve hot. Treacle tart – there's nothing quite like the amazing taste of a freshly baked treacle tart. The caramel colour, the way the insides seem to melt and ooze out of the slice sometimes, the buttery, crumbly base, all make for one stunning desert. One of the main reason university students have so poorly balanced and unhealthy meals is that they don't have a lot of money. Food, especially the healthy kind, tends to be expensive, which acts as a deterrent to a student trying to keep his eating habits in normal limits. However, you can still eat healthy even of on a budget, if you choose the right recipes. Hash browns, all kinds of pancakes and French toast – they require very little and very cheap ingredients. Eggs – use eggs as much as you can, in all the combinations you can think of. They are amongst the cheapest and healthiest foods. ​Pasta – pasta is very cheap as well and there are literally thousands of recipes out there. This means you won't get bored very easily by this dish. ​Sandwiches – choose light and healthy ingredients, such as chicken, turkey, vegetables, peanut butter, and cheeses. They are also fairly cheap. Choose fruit over store bought sugary treats. They are a lot cheaper, not to mention healthier. Stick to local and seasonal fruits and vegetables. They will always be cheaper than exotic ones and those which are out of season. Never go for fast food. Apart from the fact that it's extremely bad for your health, it will never keep you full, satisfy your hunger or your body's need of proteins and vitamins. You will end up spending much more than you originally thought. Homemade sweets are a lot healthier and much cheaper than store bought ones. Simply because, making a humble pie at home will cost you a few pounds and it serves one person for three days. If you happen to be a vegan, then you might be in luck as far as spending money on food is concerned. Meat is by far the most expensive food group and it's the one exact thing you've decided not to eat. As far as ideas go, the recipes are basically the same, only that the meat is replaced with other ingredients. Bean and butternut chili, where the butternut squash replaces the beef. Vegan tortillas, that are full of tomatoes, corn, courgette, fresh peppers, and onions. ​Spaghetti or any other type of pasta for that matter, mixed with absolutely anything you want, from vegan-friendly pesto to Pasta Primavera. ​Stews are another great idea because they allow you to successfully combine an amazing assortment of vegetables into one, super dish. Going raw-vegan while in university is not easy, because it can't really be done on a budget. It's a well-known fact that raw-vegan recipes require a multitude of ingredients, which is why they are, usually, costly. You can grow sprouts yourself. All you need are a few jars and some seeds, which are almost always inexpensive at specialized stores. Focus on the staples of raw cuisine and always keep them in your pantry – all sorts of seeds, dried herbs, mustard, lentils, and all sorts of beans, sprouting seeds, oats, wheat berries, stevia, nuts, sundried tomatoes, wasabi, and quinoa are just a few. Always be on the lookout for deals because most of these ingredients are pricey. When you spot such a deal, hurry and stock up your pantry. ​Buy in bulk. This means never buying 100 grams of something, but, as stated above, stacking up. ​Go for online shops instead of traditional ones. Usually, if you buy enough of something, they will give you a big discount. ​Find ‘shopping-buddies'. If you have friends or colleagues who share your appetite for raw-vegan meals, convince them to pitch in and buy the products you need. Remember, for online stores, the more you buy, the bigger the discount. ​Go to ethnic markets, because they too offer great deals on special products. ​Use as many inexpensive substitutes as you can, while you are tied to your university budget. For example, you can replace lemon and lime juice with vinegars, as they are considerably cheaper. Sunflower seeds can replace almost every other nut and seed in any recipe, while sesame seeds go great with tahini and hummus. Eating healthy while in university is not such a tricky business after all. Most students end up on a very bad meal plean during their academia years simply because they give up trying. Cooking is not difficult, as proved by all the recipe ideas we showed above and it's not expensive either. Actually, dinning out and eating fast-food is a lot pricier than cooking for yourself.